Sathya Sai School Kisaju has been featured in the Nov 2017 issue of Sanathana Sarathi (Pages 78-81, and 91-92). You can download the issue here (10 MB). Currently there are 9 recognised SS Schools in Africa: 3 in South Africa, 2 in Kenya and 1 each in Ghana, Congo DRC, Madagascar and Mauritius. The schools subscribe to Sathya Sai World Foundation (SSWF) Guidelines, promoting both academic and human excellence. The SS School of Chatsworth, South Africa is a comprehensive day school catering for Grade R to Grade 12 and is now in its 20th year of existence. The school annually records a 100% matriculation pass. The SS School of Kisaju, Kenya is a classic residential primary school and is well managed by the Education Trust of Kenya by SSIO. An environment friendly secondary school is due to be inaugurated in 2018. Both the Kisaju and Uthiru Schools achieve high academic standards in Kenya. SAISSE provides professional support to the 3 South African, 2 Kenyan schools, Mauritius and Ghana SS Schools. The Sathya Sai Education Trust of South Africa offers good governance and financial, asset and human resource management whilst the SSIO South Africa provides ongoing infrastructure, maintenance and financial support to all 3 schools. Accreditation of Sathya Sai Schools: The SSIO International Education Committee is currently reaching out to all SS Schools to undergo an accreditation process. The 3 South African SS Schools and SS School Kisaju had their Accreditation Visits in June/ July 2017. Sathya Sai Partnership Schools: Partnership schools are developing in Kenya, Morocco, South Africa and Benin. These are either public or private schools, in affluent or slum areas, that have adopted the SSEHV programme. To instil discipline and motivation to learn, principals have invited SAISSE to offer Youth Leadership and Team building programmes for school prefects and senior learners. This popular two-day programme uses the ‘right brain’ approach to engage with critical value themes impacting youth. South African Department of Education Invitation: The Chatsworth District Education Manager invited three Education Committee Members to address 150 school management staff on 29th July 2017 on “handling discipline at schools”. SAISSE is now tasked with training all teachers in the district. After two years of successful SSEHV training of senior education officers in King Williams Town, Eastern Cape, the Department of Education has invited SAISSE to train all teachers in the district. Inspired by the Kisaju Sai School and the SAISSE SSEHV Teacher training, the District Education Officer, invited SAISSE to train 220 school management staff on 11-12 May 2017 at Kisaju School. SAISSE is now due to continue the training of this critical mass to implement SSEHV across the Kajiado County, linking SSEHV to the new Kenyan Education Curriculum Framework. SAISSE has published SSEHV training manuals and a SS School Handbook. SSIO Mauritius and Morocco have each launched a CD of value songs in English and French. SSIO Morocco has also translated the SAISSE SSEHV Manuals into French, and Arabic translations are underway. These will be shared via www.saisse.co.za and other sites. Form 1 learner, SS School, Kisaju: “I joined this school … because my behaviour was not pleasing …I would abuse many people. …I was able to learn human values within the first term …people were shocked …told them that everybody can join. …the founder of the school is Sathya Sai Baba whose mission… make a good society with values“. Grade 3 Learner, SS School, Newcastle: “The children in our informal settlement wait for her to come home from the Sai School. She talks to them about the values and also tells them EHV stories”. Grade 3 learner, SS School, Chatsworth: “Learnt about ‘Seva’ at the Sai School …do more Seva with his dad. He and his cousins have formed a group called ‘the Chettys’ … help feed poor people”. Learner from primary 6 of SS School Lagos: “fire broke out in the nearby village … management decided to help only the parents affected by fire …A little boy saw his mother waiting in the queue to collect items for those affected by fire. He was surprised …his house did not catch fire… He informed the teacher that his mother does not deserve any kind of help …SSEHV made him speak the truth …SSEHV always attracted him … he had a responsibility to practise the same”. Principal of the Les Ecole Union Prive School: “I received SSEHV training with many colleagues … I practise both universal human values and our Muslim religious values …and resolve many conflicts between students and their respective families …Today we speak a lot about violence, competition, war, materialism. The environment in the school … positive and peaceful. I live in peace, I see beauty in everything, I distance myself from conflict and I positively influence my family and professional entourage”. Deputy Head Teacher of SS School, Uthiru: In 2006: “I was sick with pneumonia. At 3.00 am, I saw Swami at my bedside. He stretched His hand and touched my right rib, and I got immediately healed”. In 2017, April: “In a dream Swami called me by name. Baba said: “There is life for the hopeless in SS Schools”. By the early 1990s, Sathya Sai Schools were established in Zambia, Thailand and Nepal. Similar schools were soon started in Argentina, Australia, Brazil, Canada, Ecuador, Fiji, Indonesia, Kenya, Colombia, Guatemala, Malaysia, Mauritius, Madagascar, Mexico, Nepal, Paraguay, the Philippines, UK, South Africa, Sri Lanka, Kenya and Venezuela. 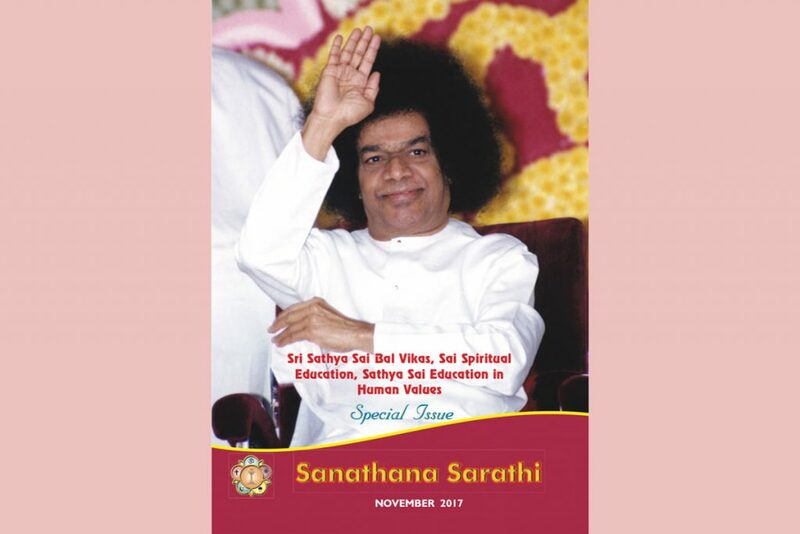 Through the pedagogy of integral education, Sathya Sai Schools around the world have become award-winning models of excellence, and the sites of visitations from educationists and government officials from around the world. Recent examples include country-wide acceptance in government schools of SSEHV training provided by the ISSE in Thailand with the Thailand Sathya Sai School as the model. In Kenya, the district education officer over 60 government schools has taken a decision to broker SSEHV training to all of them due to the influence of the Sathya Sai School of Kisaju nearby. "Love is God, Live in Love."